“But, the thing about a new arena project is that our first criteria has always been public money for public benefit, so it really is up to the Calgary Sports and Entertainment (Corp.) to figure out what the public benefit is,” the mayor continued. Again, that’s nothing new from Nenshi, who’s consistently said he won’t approve any plan without a clear public benefit. But it’s also a bit of a thrown gauntlet: You want money for a new arena, first show me why I should build you one. This is an eminently reasonable way to approach subsidy demands, whether from a hockey team or an auto plant, and provides an even better reason to consider making the great leap northward. That’s close to an even split, though the opponents feel more strongly about their opposition than the supporters do about their support. It’s actually more support than I would have expected, given that a city report estimated it would cost the public between $1.2 billion and $1.4 billion and Mayor Naheed Nenshi has summed up the plan as “a lot of money that we don’t have,” but it’s apparently right where numbers have been polling for a while now, so “split” seems a fair assessment for now. The headline news appears to be that the opening of the Edmonton Oilers‘ new arena hasn’t gotten Calgarians green enough with envy to reconsider the finances, which I guess these days qualifies as good news. There’s nothing wrong with talking, really, and Nenshi and the council seem to remain determined to take a hard line that any new venue proposals don’t involve shoveling piles of money at the teams that the public would never get back. This could drag out forever — which isn’t necessarily a bad thing, unless you’re King and his fellow Flames and Stampeders execs, wringing their hands about how their profits aren’t as big as they’d be if they got massive public subsidies for a new building or two, and I’m guessing most of you aren’t. Though with municipal elections coming up in 2017, you have to figure King and friends have in the back of their minds that maybe they can wait for a new, more-profits-friendly city government — I tried checking on Nenshi’s latest poll numbers, but they haven’t turned up, though I did discover that Calgary residents are strongly in support of playground swings. Calgary Mayor Naheed Nenshi is not your average mayor when it comes to sports subsidy deals: He’s insisted on evaluating the Flames owners’ arena plan on whether it’s good for the public, not just good for the team, openly called out NHL commissioner Gary Bettman as being a paid shakedown artist, and promised a public debate about any arena decision. Now the Calgary city manager’s staff has completed a hard-eyed analysis of the plan for a combined Flames arena and Stampeders stadium, and determined that it would cost $1.8 billion, double the total that the teams had estimated, with the public cost coming in at between $1.2 billion and $1.4 billion. The city council is scheduled to discuss the report on Monday, but it’s likely to be a short discussion — the CBC says the $1.2-billion-plus price tag “effectively scuttles the proposal as it stands.” And the report itself recommends as much, indicating that “the CalgaryNEXT concept is not feasible in its present form or location and alternative development concepts, locations, and financial models should be investigated.” In particular, it suggests looking at building a new arena near the site of the current Saddledome (which the Flames owners previously rejected as not ambitious enough) and putting a new football stadium and field house at the current site of the Stampeders’ stadium at the University of Calgary. There’s still some concern here that by focusing on alternative sites, this could end up becoming a battle of where to build the new arena and stadium, not whether to fund one with public money — though given that the report repeatedly indicates that the city government’s first priority is that “public money must be used for public benefit,” and Nenshi has said the same, probably not too much concern. Mostly, instead of taking the team owners’ demands and price figures as a given, Calgary sat down and trying to figure out if it made sense financially from the city’s perspective — and the answer came back “hell, no.” Now they’re kicking it back to the team to come up with a plan that makes sense. It’s all eminently logical and responsible, and only remarkable because so few city administrations do anything like this. So far, Flames CEO Ken King is insisting on keeping CalgaryNEXT alive: “I realize we may sound simplistically optimistic, but we still think there’s some room here,” he said yesterday, which is definitely either the first or third Kübler-Ross stage. There’s still many months or years of haggling to go here, almost certainly, but Calgary has set an excellent example for other cities on how to go about tackling the first round. Unless the Flames come along and say “we’ll help pay for the fieldhouse”, or bring something new to the concept of the fieldhouse, any discussions of a fieldhouse aren’t useful. It would be like a neighbour telling you to buy a hot tub for your backyard so he can use it once in awhile. And when you tell them you’d like a hot tub but can’t afford it, he starts regaling you with the benefits of a hot tub. And all this is at a Flames fan site, mind you. Clearly King is going to need a bigger video. Maybe something with a magic hockey puck. “I don’t know why anyone would think this is surprising or news, this is the man’s job, this is what he does,” said Nenshi. “I know that Calgarians require very wealthy people from New York to come and tell us what we need to do in our community because they understand vibrancy better than we do,” he said. This is shaping up to be a battle for the record books, especially with Nenshi enjoying strong public support for his “prove to me what’s in it for taxpayers” stand on the Flames’ arena plans. Bettman to Calgary: Get new Flames arena for only $490m, act now, supplies limited! [NHL commissioner Gary] Bettman told [Calgary]’s business community at a chamber of commerce event Monday there should be more urgency to get the project underway, particularly from city council. The Scotiabank Saddledome, built in 1983, will be the oldest NHL arena when Canada celebrates its 150th birthday in 2017, he said. Anyway, this appears to be a somewhat new twist on the old stadium playbook, with Bettman arguing that Calgary residents shouldn’t look at the sticker price, but rather act now because this sale won’t last forever! Which isn’t a new twist in the marketing world, but hey, half of Bettman’s job consists of declaring these kinds of ultimatums, so give him credit for at least coming up with a new way to phrase it. When writing about public votes on stadium or arena plans, I’ve occasionally gotten in trouble from readers for mixing up “referendums” with “initiatives,” which are apparently very different things, at least in some places like California where people actually get to vote on things directly on a regular basis. The mayor isn’t in favour of that idea, saying in his interview that he’d like to see council make the decision. He points to the complexity of the proposal, and how difficult it would be to arrive at a simple yes or no question. This idea represents a massive change to our city, with a lot of moving parts. Council is supposed to have the expertise to scrutinize this stuff and arrive at conclusions. That’s why we elect these folks. But city hall could also decide to use that expertise to negotiate a much better deal with CSE, and then bring it to a thumbs-up/thumbs-down public vote. It’s a fine enough idea in the abstract, and one that CBC readers seem to mostly agree with in the site’s own web, er, plebiscite. (Really, it’s amazing that even 29% of respondents would say “No, I don’t want to have a vote on this” for anything, but maybe Canadians are just polite that way.) 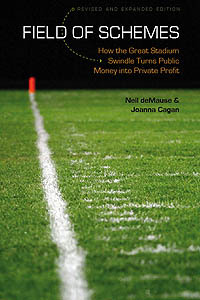 But there are some problems with “Let the people decide!” as a complete solution to the question of sports subsidies. First off, holding a public vote isn’t always a guarantee of the public getting what it wants, for the simple reason that money can often play a bigger role in referenda/initiatives/plebescites than in the usual political process. Back when Joanna Cagan and I were researching the first edition of Field of Schemes, we got to hear Jay Cross, then an executive with the Miami Heat, talk on a panel about public votes where another panelist had said it was too risky to put your entire project in the hands of voters. Nonsense, countered Cross: He’d rather put things to a vote every time, because he knew that by spending enough money on a campaign, he could all but guarantee a win — at which point he showed video clips of the multimillion-dollar ad campaign that eventually won the Miami Heat more than a hundred million dollars in arena subsidies. In Calgary’s case, Mayor Naheed Nenshi has been a staunch skeptic of the Flames/Stampeders plan, such that the teams’ owners might see making their case directly to the people as a better option, especially given that this is one of those everything-including-the-kitchen-sink development plans that makes the financing (and benefits) as confusing as possible. Nenshi, interestingly, would rather have the city council decide than go to a public vote, which could just be local elected officials defending their turf, or could be a tactical move of his own. Anyway, all this is to say that direct democracy, while a fine goal, isn’t any less susceptible to the corrupting influence of money than anything else in this universe. (Or even the alternate universe that is Canada.) The best solution, as always, is transparency and education about the real economics of sports subsidy plans — hopefully CBC Calgary can tackle that next. King downplayed the project’s detractors, saying they were the vocal minority. “There are people that are against anything that’s ever built,” he said, singling out the Canadian Taxpayers Federation, which recently launched an online petition in protest of any tax dollars being used to fund the project. “People who hate are going to hate,” King said. Oh, Ken — so close. Also, implicitly dissing the guy across the table for you by calling him a hater if he doesn’t cut you a nine-figure check doesn’t seem like the best negotiating strategy to me, but maybe this is just how they do things on the mean streets of Canada. Katie Baker in Grantland has an article that does a really cool thing, taking the “Art of the Steal” chapter from Field of Schemes (and subsequent “Art of the Steal Revisited” chapter from the expanded edition) and applying it specifically to the Calgary Flames owners’ arena demands. Best quote in the piece, though it’s not new and wasn’t particularly said about arena demands (it was about hockey lockouts), is from current Flames president Brian Burke when he worked for the Maple Leafs: “My theory is, make the first meeting as short and unpleasant as possible. Sometimes it’s better to just punch the guy in the face.” Not sure if demanding at least $490 million in taxpayer cash while claiming this would be for the public good quite qualifies as a punch in the face, but it’s pretty close!